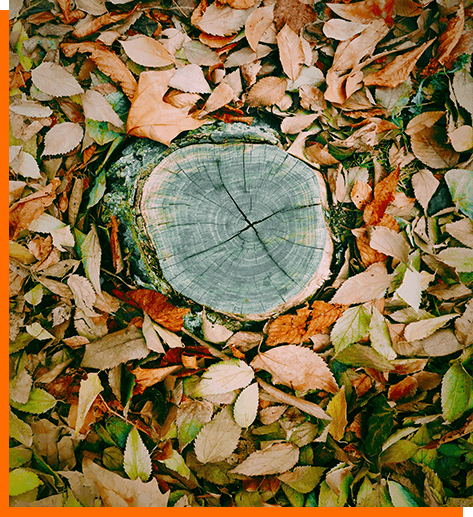 If a tree on your property has fallen down or been cut down in the past, you have been left with an unsightly tree stump that can become a tripping or driving hazard should it become camouflaged by weeds, grass, or other plants. If left alone it will likely send out new sprouts (suckers) which can use the roots of the removed tree to thrive and grow into new trees. Stumps that are left, even if they are cut to ground level, can hamper future paving or construction projects. In an even worse scenario, old tree stumps can become ideal habitats for termites and they can move to any surrounding homes, sheds, and fences. So it makes sense to have those stumps removed. You have two options here: tree stump removal and tree stump grinding. Stump grinding is considered by many to be the safest and most environmentally friendly method of removing tree stumps. It involves using a high-speed stump grinder to grind away at the stump and obvious roots, reducing them to something between wood chips and sawdust. The grinding usually is just below ground level but can go deeper if required. Tree roots are notoriously deep, and travel in many different directions underground, so it is almost impossible to undertake complete tree root removal using a stump grinder. Complete stump removal of older trees usually requires the use of heavy equipment, which understandably comes at both a financial and environmental cost. This type of equipment is most often used when clearing large blocks of land rather than in domestic situations. The tree stump and root are lifted out of the ground, together with any surrounding soil and vegetation, leaving a large hole that can be leveled out later if required. The arborists at Kingfisher Tree Services know exactly how to remove your stumps and what equipment to use. We will be minimally invasive to your property with great care for the surroundings. To arrange a no-obligation quote, we invite you to call our qualified and fully insured arborists today 0458 733 489 or email your enquiry to info@kingfishertrees.com.au.